Data > Filter menu or by simply right clicking any cell within a criteria field in your data table. With version 2.2 you can also filter on fill/font colors (Normal and Conditional Formatting colors) and on bold cells. 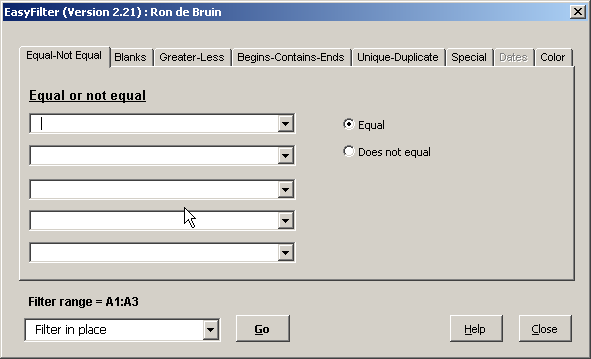 On the Blanks tab you can also filter now on Formulas that evaluate to "" and Formulas that don't evaluate to ""
If you need help please read this Superb manual (for version 2.01) first from Norman Harker. All examples shown in this User Guide are examples that use the EasyFilter Sample Database.xls file. This Version of EasyFilter is dedicated to the memory of Excel MVP Frank Kabel who was tragically killed in an accident in his home country of Germany on 5th January 2005. Frank was a tireless tester of the Beta editions of this version of EasyFilter and made many suggestions and comments that make this version what you see today. Some suggestions for development and methods of execution still remain to be implemented in later versions. The Excel community has lost one of the most prolific communicators, educators, and application developers. We have lost a good friend. Many Thanks to Dave Peterson, Bill Manville, Bob Phillips, the late Frank Kabel and Norman Harker for their help and suggestions.